Ra-men bars and restaurants have been popping up across Melbourne at a rapid pace for the last few years. And if the the lineups on opening day at Ra-men Bankara Doncaster were anything to go by, the Ra-men boom is still pumping and the trend is real! Tokyo Tonkotsu commissioned Studio Ginger to assist with positioning their food brand in Australia's sophisticated food marketplace. Bankara, a colloquial term once used in Japan to describe an individual's unique and exceptional style, was the nod for us to create an interior that stayed true to their traditional origin and style. We did this by incorporating a mix of both modern and raw finishes for an authentic concept. The long bench seating under the open kitchen caters for the lunch time rush of people on the hunt for the Ramen Bankara journey of the five senses: taste, smell, touch, sight and sound which is offered to every customer, wrapped in the soul of "First Slurp" philosophy. The timber battens and large reclaimed timber beams provide the textural back drop to the natural oak eating surfaces. 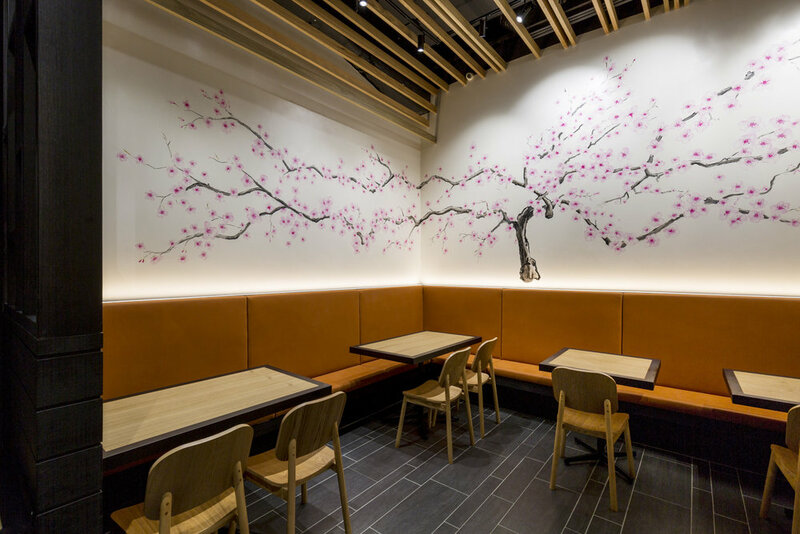 The hand painted cherry blossom mural provides a fresh softness to the rear of the restaurant, and the banquet seating zones the area for more intimate gatherings.